In Magnificent Style is the first on the Death of Glory! series of games which attempts to depict those infamous "forlorn hope" attacks of history. This solitaire, history themed, push-your-luck game depicts the final, desperate Confederate attack on 3 July 1863 at the Battle of Gettysburg, popularly known as Pickett's Charge. 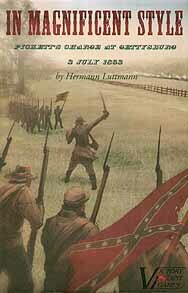 As General Longstreet, you must decide how quickly to press your troops across this deadly open ground before allowing the men to regroup for another bound. But time is not on your side, and the longer your stalwart soldiers remain in this maelstrom of enemy fire, the more dangerous it becomes, and the less likely they will arrive with the verve and umbers required to carry the day. Those are your options: Death or Glory.